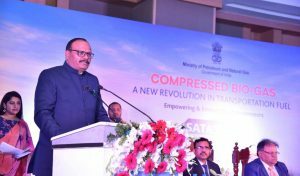 Oil marketing companies have conducted a Road Show on ‘SATAT’ initiative at Lucknow on 3rd December’2018 on behalf of Ministry of Petroleum and Natural Gas, a joint initiative of Bharat Petroleum, Indian Oil and Hindustan Petroleum. Shri Satish Mahana, Minister, Industrial Development & Shri Brijesh Pathak, Minister Legislative, Justice, Conventional Energy Sources, Political Pension& Director Marketing BPCL, Shri Arun Kumar Singh graced the occasion. Also, Senior officials from MOP & NG, Uttar Pradesh State Bio-Energy Development Board, and OMCs were also present during the event. 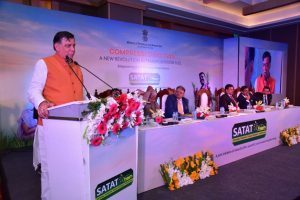 Shri Satish Mahana, & Shri Brajesh Pathak addressed the forum and gave details on how the UP government is working to promote SATAT initiative to help farmers, entrepreneurs, and environment. They also highlighted the support provided by the UP Government to encourage entrepreneurs to make the investment in the state. Director Marketing BPCL Shri Arun Kumar Singh emphasized the importance of initiative in the context of current energy requirement of the country including environmental issues and how this aspirational initiative will help the nation towards achieving energy security and resolving environmental issues. ‘SATAT’ (Sustainable Alternative Towards Affordable Transportation) initiative was launched by Union Minister of Petroleum and Natural Gas & Skill Development and Entrepreneurship Shri Dharmendra Pradhan on 01.10.2018, under which Oil Marketing Companies(OMCs i.e. IOC, BPCL and HPCL) are inviting Expression of interest (EOI) from potential entrepreneurs to set up Compressed Bio Gas (CBG) plants and supply CBG to OMCs. ‘SATAT’ initiative envisages establishing 5000 CBG plants across the country with an estimated production of 15 MMT CBG per annum by 2023. Compressed Bio Gas (CBG) is purified and compressed biogas, which is produced through a process of anaerobic decomposition from various waste/ biomass sources like agriculture residue, cattle dung, sugarcane press mud & spent wash of distilleries, sewage water, municipal solid waste (MSW), biodegradable fractions of industrial waste etc. CBG has properties similar to CNG, thus it has the potential to replace CNG in automotive, industrial and commercial sectors. OMCs encourage entrepreneurs and Industrialists to take advantage of this new business opportunity and be part of this noble initiatives ‘SATAT’which also compliments the Swachh Bharat Abhiyan& contribute to the development of the nation. Under this initiative, OMCs are offering remunerative price for procurement of CBG with the long-term commercial agreement for entrepreneurs. The event was really good in terms of understanding the Government schemes, Technologies available in the market for CBG. Investors and entrepreneurs took a lot of interest in the whole initiative. A few entrepreneurs were also invited during the Show to present their experience and suggestions to make the overall initiative a grand success in the time to come. 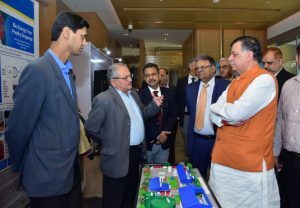 these entrepreneurs also displayed their technologies which evoked a lot of interest among all stakeholders present during the event.